Improving the formability of the material is a key issue in the deep drawing process. Heating the material above its recrystallization temperature drastically increases formability, but in the case of dual phase (DP) steels, it results in a loss of their mechanical properties. To improve the drawing ratio, only the heating of the flange region in the warm temperature range up to 573 K was studied on DP600 sheet steel by numerical simulation. 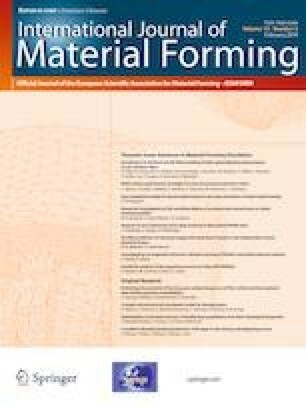 A thermo-elastic-plastic finite element method (FEM) analysis of deep drawing at several drawing ratios was performed and compared with experimental results. During the experiments, the flange area of the blank was heated by induction heating, and the central part over the punch was cooled with spray water. Experimental results showed that limiting drawing ratio could be increased by 25.58%. The microstructure of the DP 600 steel was analyzed before and after the warm forming process. No significant changes were observed, and the high strength properties of the DP 600 steel remained intact. There was good agreement between numerical and experimental results. The authors would like to acknowledge the financial support received from The Scientific and Technological Research Council of Turkey (TUBITAK) and Slovenia(ARRS) under Project No: 111 M448 and from ATILIM University under the project No: ATÜ-BAP-1011-13. The use of facilities in the Metal Forming Center of Excellence at ATILIM University as well as Faculty of Natural Sciences and Engineering, University of Ljubljana is also acknowledged and thanks are extended to the personnel for their contributions on the material tests and the use of HPC.